When SparkFun got a shipment of 1:8 scan rate panels, it fell on me to make them work with the wrong library. A few weeks ago, SparkFun got a shipment of 1:8 scan rate RGB matrix panels by mistake. We had ordered 1:16 scan rate, because this is the most common panel among hobbyists and is directly compatible with a number of Arduino libraries. When we realized that these panels weren't exactly what we had ordered, we decided to turn lemons into lemonade and write some supporting Arduino code. What followed was nearly two weeks of unspooling and modifying Adafruit's RGB-matrix-panel library. While I reverse engineered Phil Burgess and Limor's excellent work, I learned more than I've ever wanted to know about these types of displays and what it takes to drive them in full color. 1:8? 1:16? What's the difference? If you're anything like me, it's probably not immediately obvious what's meant by "scan rate" or why it's given as a ratio (or sometimes a fraction). In order to understand you'll need to know a little bit about how these displays work. RGB matrix panel displays are fundamentally different from other types of panel displays like our Flexible LED Matrix, for instance. Whereas the Flexible LED Matrix is built from a grid of addressable WS2812B LED modules daisy-chained together, the RGB Matrix Panel is actually comprised of standard tri-color LED chips. Each color of each LED is driven by one bit of a shift register and all of the shift registers are then daisy-chained together, allowing you to drive all of the LEDs by clocking in high or low bits for the red, green, and blue LEDs individually. Because the LEDs are driven by shift registers, there is no individual PWM capability and thus these displays are natively 8-color displays. There is a clever way around this that we'll talk more about later. To better understand how this shift register business works, let's have a look at a simplified model. I've put together an animation of a single color, 4x4 matrix. Take a moment to study that and then we'll walk through the cycle. It may be silly to drive 16 LEDs this way, but when you start getting into larger numbers it's incredibly helpful. Sure, you could drive all 16 of these LEDs at once, but if you have a matrix of 1024 LEDs you're not going to just clock in all those pixels and latch them out at once because the current consumption would be huge! Instead, the trick is to take advantage of an effect called "persistence of vision" in order to build the image a few pixels at a time by "scanning" your way across the display. Pull the latch and output enable pins high. This enables the latch, allowing the row data to reach the output driver but it also disables the output so that no LEDs are lit while we're switching rows. Switch rows by driving the appropriate row select lines. Pull the latch and output enable pins low again, enabling the output and closing the latch so we can clock in the next row of data. If we repeat these steps quickly enough your eyes won't be able to tell that only one row at a time is lit and the complete image will appear on the display. Obviously, the more bits we need to clock in, the more slowly this cycle goes. To address this, RGB panels are built to allow us to clock in the bits for our red, green and blue LEDs at the same time. On our 16x32 displays, data is clocked in 3 bits at a time on 3 input lines. Each clock cycle, then, represents one of the 512 pixels of the display. On larger displays, like our 32x32 display, data is clocked in 6 bits at a time: 3 represent a pixel at the top of the panel and 3 represent one at the bottom. Each clock cycle in this case represents 2 pixels of the display, so to write to the entire display in both cases would take 512 clock cycles. The scan rate, then, describes how many pixels we're scanning at a time. In a 1:16 scan rate panel, we're lighting 1/16 of the pixels at any given time. on a 32-pixel wide display, this is pretty convenient as each of those 16 groups of pixels becomes 32 pixels long, exactly one row. First, it takes advantage of a technique called Binary Code Modulation, or BCM. Whereas PWM is really only practical using dedicated hardware — like the PWM capable pins on the Arduino — BCM is much more economical. This is because unlike PWM, which uses a number of interrupts to maintain a fixed frequency, BCM takes advantage of the nature of binary numbers to alter the duty cycle of an output pin. Consider a 4-bit number in binary: Starting from the least significant bit and moving left, each number place doubles in value from 1 to 8. If you assume that value to be the length of a delay then you wind up with a 4-bit number that describes 15 "time-slices," starting from 1 slice at the least significant bit, then 2 slices, then 4, then 8. These slices can be mixed and matched to whatever duty cycle you need. If you consider that having no slices is a valid state, you wind up with 16 possible duty cycles. For instance, if our 4-bit number is 0101, it represents a 5/16 or 31% duty cycle. Because we're switching the state of our LED at fixed intervals, the BCM method requires a fixed overhead for any number of outputs at a given precision. This makes BCM very attractive for situations where you either need to spend your clock cycles carefully or you need to be super fast, both of which apply here. The second trick, in a way, is a natural extension of the first. Because we need to modulate entire rows of LEDs at once, we need to decide ahead of time which LEDs in each row will be lit during each of our "time slices". 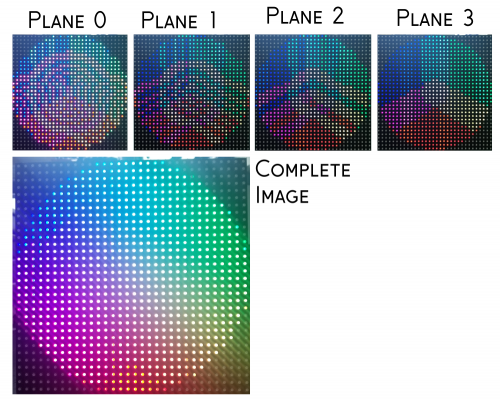 Basically, we're going to create four image buffers, each of which essentially contains an 8 color version of our image that represents which color channels need to be on during that "bit" of the total time-slices. As we count up through the 16 states that our BCM can be in, each of the four bits will correspond to one of these buffers or "image planes". The images themselves are made using the adafruit_GFX library which is included as a dependency to RGBmatrixPanel. That library takes care of things like rendering text and geometric primitives as well as assigning colors. Whenever that library wants to interact with the RGBmatrixPanel library, it does so using RGBmatrixPanel's version of the "drawPixel" function. This is the function that knows how to split each pixel into four planes and pack them into the buffer. 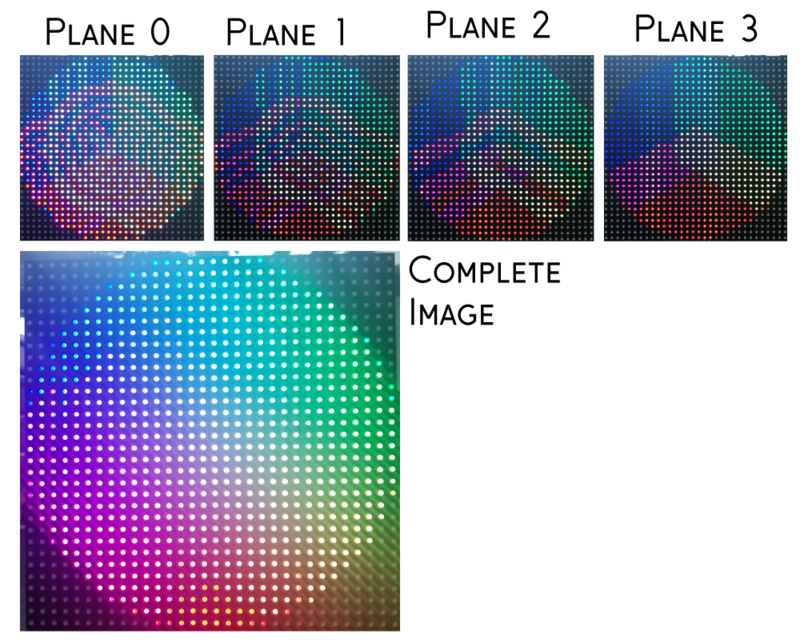 Because each plane is 6-bits (two 3-bit values for each clock cycle, because we write to the top and bottom of the display at once) and because we need to store four of these planes per pixel, we use a packing scheme wherein each pixel is represented by 3 bytes. 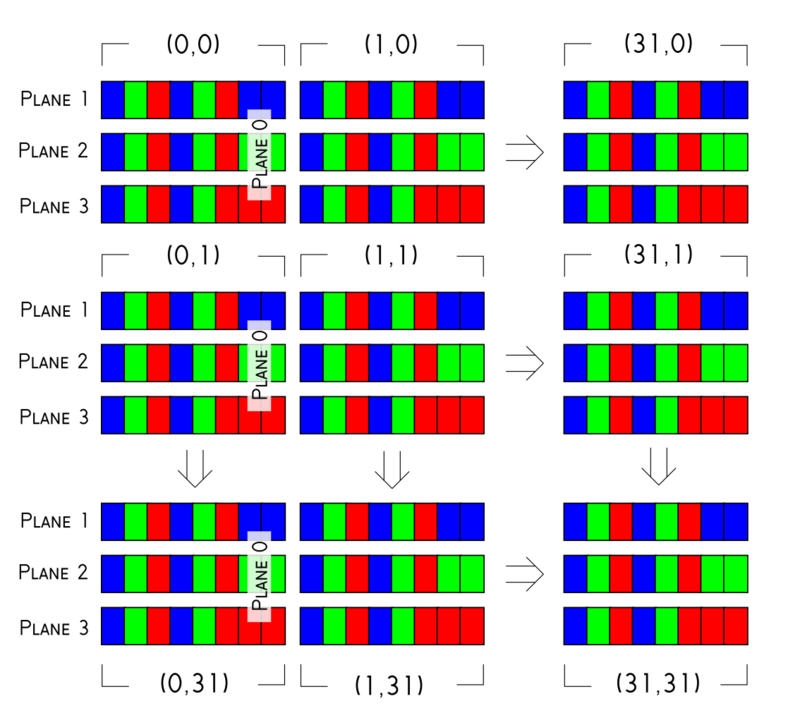 The six upper bits of byte one is plane one, the six upper bits of byte two is plane two, the 6 upper bits of byte three is plane 3. Finally, the unused lower two bits of all three are used to store plane 0. In the case of the 1:16 scan rate displays, a "row" is 32 pixels and so it really is a single contiguous row of the display. This makes writing our buffer data out to the display very straightforward from here. We just step through each row and clock out every image plane for the correct amount of time. For plane one, we just push the upper six bits to the port of our controller that the row select pins are on. Do this for each pixel in row one and we're done! For plane two, we do the same thing but now we've started where we left off in the buffer, which is the first pixel plus the length of a row, so we're now clocking out "plane two" bytes. Then the same with plane 3. 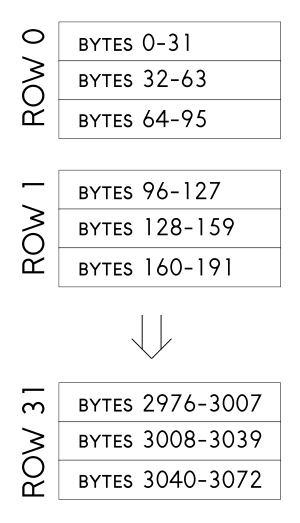 Plane zero requires a little more effort as we need to reconstruct it from the lower 2 bits of the three previous bytes. Luckily, since we're using BCM, we can arrange our planes so that plane three has the most time slices thus covering for the time plane 0 needs to get rearranged. Instead of dragging you through my changes to this library chronologically, as I figured out what worked and what didn't, I'm going to see if I can describe logically how I got to where I am. Let's start by outlining the technical differences between the 1:16 panels that the library was written for and the 1:8 panels that I had to get flashing. Fewer, longer strings of LEDs. This means that each time we increment the row selector, we need to clock out 64 pixels and not just 32. We only need 3 row selector pins now because each "row" is twice as long so we now have 2^3 rows. The order of the pixels on this display is a little weird in an effort to avoid image tearing. So if we don't want our image to get scrambled on its way to the panel, we need to "reverse scramble" it first! We could do this by transforming the entire buffer but it would be hard to guess when is the right time to do that, since we don't necessarily write over the entire buffer every time we draw pixels. Instead, I opted to create a mapping function that transforms a pixel position received from the adafruit_GFX library into the appropriate "reverse scrambled" pixel position in the buffer. This was achieved using a pair of arrays which I constructed by mapping the target x and y positions of every pixel in the buffer according to their respective positions as reported by the GFX library. To get a "reverse scrambled" pixel location, you use the x and y positions from the GFX library to get the variable at position (y * 32 + x) in the array. There is one array that contains x coordinates and one for y coordinates. Together, these allow us to write our pixels to the correct locations in the buffer. Even though — physically speaking — our 1:8 display has the same number of rows as our 1:16 display does, electrically it only has half as many. This means if we leave the timing of the 1:16 library intact, we'll get strange errors as it counts from 0 to 15 on the four row select output pins but our display is only listening to three of them. Luckily, this is a very minor fix as the RGBmatrixPanel library is designed to work with 32x32 as well as 16x32 1:16 panels and so there's already a conditional expression that controls whether it continues counting when it reaches 7 or just starts over. All we need to do is make sure that conditional never forks in the "keep counting" direction. In my case, I did it by removing the conditional branch entirely. No problem. In a 1:16 display, a physical row is the same as an electrical row. That is to say, if we clock out 32 pixels and advance our buffer pointer each time then we land on the start of that row in the next plane. Once we've worked through all of our planes, we land on the start of the next row. Our pointer is always where it needs to be simply by incrementing as we write out our bytes. In the case of the 1:8 displays, however, it's not so simple. Speaking of simplicity, the fact that electrical rows and physical rows are different is going to get confusing. Let's call the physical rows on the display "lines" instead. We need to write out pixels, but remember that our planes are divided into groups of 32. If we simply clock out 64 pixels in a row, we'll end up clocking out the first 32 pixels of line0/plane1 followed by the first 32 pixels of line0/plane2. What we need to do is to clock out 32 pixels and then increment our pointer past the line0/plane2 and line0/plane3 data and then continue clocking out the following 32 pixels (which will be line1/plane1). This will land our pointer, however, on the beginning of line1/plane2, which isn't where we want to be, so we need to decrement the pointer back to the beginning of line0/plane2. Finally, when we're ready to move to the next row (line 2) our pointer will be at line1/plane1 so we'll need to increment again to skip over the entirety of line 1. To get a better feel for how this works, let's unroll some of the code. When our pointer is at zero, our first job is to clock out plane 0. This plane needs to be reconstructed from the lower 2 bits of three separate bytes so we construct our byte using left-shifts, ORs and bit-masks and then assign it to DATAPORT. That variable is actually defined as the output port that the row select pins are connected to, so as soon as we assign a value to it, the pin states on the microcontroller change. As you can see in the code below, we start at the current pointer position (ptr+0) and go to ptr+32, then we skip to ptr+96 and clock out pixels until ptr+128. Because this is plane 0 and we're mixing and matching bits from all over the place, we don't actually advance the pointer, because we want plane 1 to pick up at the current address. Here, we clock out pixels from the current address to ptr+32, then skip to ptr+96 and clock out through ptr+128, just like in plane 0. There are a few differences this time, however. First off, we can write each byte directly to DATAPORT since it's pre-composed in the buffer. Secondly, we advance the pointer 32 bytes for each plane so that we will continue to move through the buffer and not clock out the same row over and over. Finally, if we're clocking out plane 3, we make sure to increment the pointer 128 bytes when we're done. This is to skip over the line that we've already clocked out by jumping ahead 96 bytes between for loops. The original library optimized the code for planes 1-3 quite a bit by writing them directly in assembly language to take advantage of an instruction that allows a pointer to be incremented after it's loaded. The compiler didn't recognize the opportunity to use this instruction, so the programmer forced the compiler to implement it, saving precious clock cycles. After playing with it a little bit, I decided it was a lot of squeezing for not much juice, especially after you add our goofy logic to jump the pointer around all over the buffer. The most important line here is where they set ICR1, which is the Input Capture Register. In this case, however, that register stores the top value of the Timer1 counter. In other words, they've set up an interrupt that fires every time that the Timer1 counter reaches the value in ICR1. This value, then, determines the frequency of our updateDisplay interrupt and we'll be updating that variable as we switch planes in order to achieve proper BCM timing. Next, we have some magic numbers that are used to calculate the new ICR value for each image plane. These numbers are CALLOVERHEAD — the number of ticks between when the interrupt fires and when the updateDisplay function actually starts running — and LOOPTIME — the number of ticks spent inside plane 0. These were apparently measured and then some extra wiggle room was added to account for compiler differences. The changes that we made to the code won't affect the CALLOVERHEAD duration, but the LOOPTIME duration is probably about double (the published version of my 1:8 hack for Adafruit's library indeed doubles this value from 200 to 400) because we need to clock out twice as many pixels per row. The new ICR value (or the interval before we write new pixels to the display) is determined by doubling the CALLOVERHEAD value (to account for the time it takes to get into and out of the interrupt function) and adding it to the LOOPTIME value. Then, for each successive plane, we double the LOOPTIME value in order to establish our BCM timing wherein each plane from 0 to 3 is displayed for twice as long as the last. Generally speaking, whenever you add new functionality to an existing open source library, you should contact the author and suggest they pull your work into their original library. In this case, that would entail filing a pull request to the Adafruit GitHub repository. One stipulation of a proper pull request, however, is that your additional features don't break the existing feature set. In other words, I would need to expand the RGBmatrixPanel library to accept an argument switching it into 1:8 scan mode. Furthermore, for the sake of completeness, I would need to preserve the ability to operate both 32x32 and 16x32 panels at both scan rates. Because of the way the library is structured, this would require considerable alterations that might stretch the scope of what it was written for. I decided that the best course of action was to distribute the modified library as a separate utility specifically for driving 32x32 1:8 panels. If you think that I'm wrong about 1:8 compatibility being out of scope for the RGBmatrixPanel library, I won't be at all bothered if you use the information outlined in this post to write a properly integrated library and submit a pull request of your own! 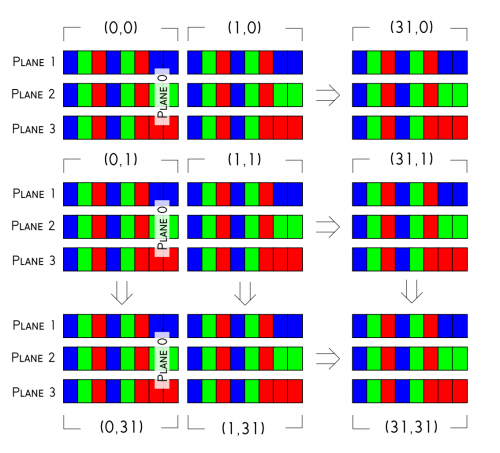 Iâve got to say this is the best description and explanation Iâve seen on led matrices. Actually, this one of the best article Iâve read on Sparkfun period. The graphics really drive the points home. Nick must have spent some time on this. Itâs also great timing for me as I just picked up a case of 12 64x64 1:32 matrix panels. Although I knew the basics, the discussion on BCM, planes, and buffers really gave me insight to the driver. Thanks, I'm glad it was helpful! Good luck with your case of panels! Hi Nick, have you read my comment? I really need your help. Hi! I really appreciated your explanation, it has helped me a lot to control a led panel by myself and to modify the adafruit library to make it work with a 16x32 panel with a 1/4 scan rate. I found a little mistake in the plane 0, blue an green are stored in the 2 first bits of plane 1, red is stored in the second bit of plane 2 for the top display, and blue is stored in the first bit of plane 2 and green and red are stored in the 2 first bits of plane 3. Nick, 100 kudos to you for writing this. I thought I mostly knew how those panels worked, but your page does a fantastic job explaining the details. You are my Matrix-Hero. I have also a 1:8 scaled Matrix. When i use your librarie. I have 8 blocks. But not on the corectli Position. what i can do? Have you an idea? Beautiful and clever explanation and coding, I can't imagine that I can do what you did Nick. I have try to hack for 32x64 1:8 so bad, but still nothing. Can you help me Nick? Hoping to hear for your reply Nick.